Our Christmas Gift Baskets for families (or a large group) have a superb assortment of gifts for everyone on your holiday list! 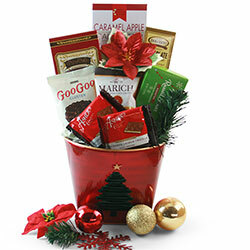 Whether you want to spread holiday cheer or show your appreciation, these holiday baskets will send your merry message! 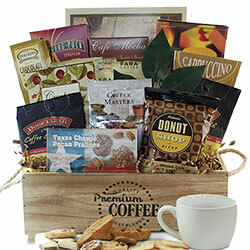 We also have a delicious and festive array of corporate gift baskets that include intoxicating chocolates and cookies, savory snack mixes, and gourmet delicacies! There will be parties for hosting and marshmallows for toasting... Yes, the holidays are upon you and the group festivities are underway. You’ve got a stockpile of marshmallows ready, but have you checked off all the gifts for the people on your “Nice” list? 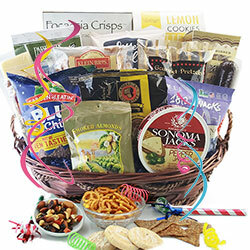 Our Christmas gift baskets for families are full of treasures the whole clan can enjoy, filled with good cheer, gourmet snacks, and tasty treats. Give a basket to your neighbors or oldest family friends — there’s plenty to be grateful for this season. Family Christmas gifts can be hard to shop for. You either don’t know them well enough to be certain of their likes and dislikes, or you know them too well and it will be impossible to make everyone happy. 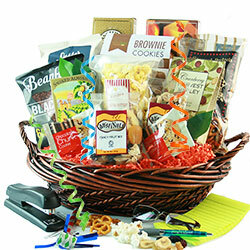 That’s why our Christmas gift baskets for families are the ideal present. 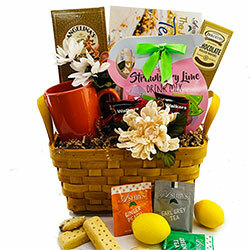 Each basket is holiday themed, some with more specific concepts than others, and there are a diversity of products included. 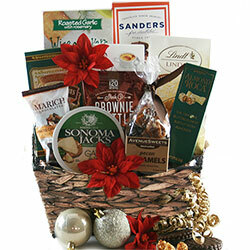 For example, St. Nick’s Holiday Assortment Christmas Gift Basket is a crowd pleaser with a host of sweet treats that include caramel popcorn, truffles, almond roca, and two bottles of wine (the varietals are your choice). The rich aroma of a flavorful brew will be the saving grace of parents around the world as they’re woken up in the wee hours of Christmas morning. 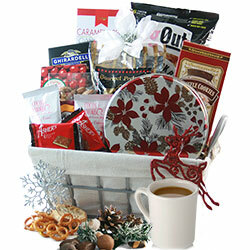 Make sure these adults are stocked up and fully prepared with our Christmas coffee gift baskets. With brand names like Coffee City, Jo Coffee, and Coffee Masters, any caffeine fiend will be happy. 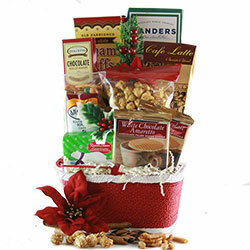 These family Christmas gift baskets also include gourmet treats like seasoned pretzels, wafer cookies, and apple cinnamon pancake mix. For many holiday celebrations, glad tidings come in the form of a bottle. 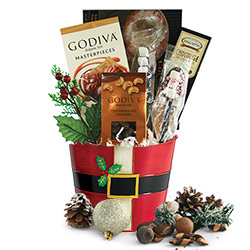 Let the spirits flow and toasts abound with our Christmas Wine Gift Baskets. Each basket comes with at least one wine bottle and you get to choose the varietal. 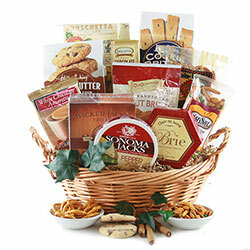 The White Wine Christmas Gift Basket includes a bottle of white, as well as gourmet snacks to complement that lighter flavor: chocolate wafer cookies, chocolate covered berries, and wafer rolls. 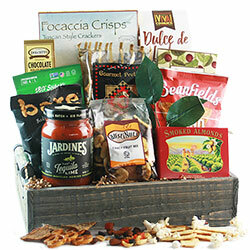 For the other end of the taste spectrum, the Red Wine Classic Wine Gift Basket comes with a bottle of red wine (or white), gourmet truffles, caramel popcorn, and other indulgences. Or why not treat someone to a bottle of both? Some of our family gift baskets for Christmas come with two to five wines, so you can be sure your recipient’s palate is pleased. As Charles Dickens once said, “There’s nothing better than a friend. 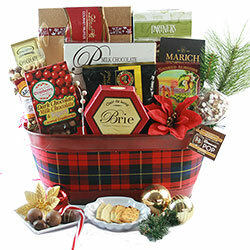 Unless it is a friend with chocolate.” Be that best friend Dickens is thinking of this holiday season by giving your loved ones our Christmas Chocolate Gift Baskets. 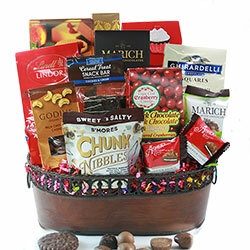 Dark chocolate, milk chocolate, cookies, candies, drinks — you name it, and you’ll find it in these gift baskets. 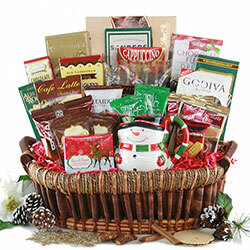 One popular choice is the Holiday Chocolate Classic Christmas Gift Basket. With chocolate caramels, chocolate biscotti, chocolate sandwich cookies, and more, you have the perfect gift for anyone with a soft spot for the holiday treats. 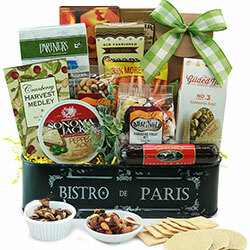 Do you need a gift for a family full of refined taste buds? Does this group prefer only the purest ingredients and finest flavors in what they eat? 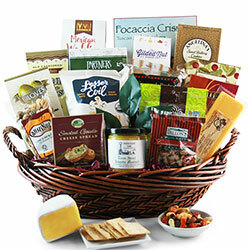 It’s official — you’re shopping for foodies and our Christmas Gourmet Gift Baskets can help you make those picky palates happy. From the salty to the sweet, these gift baskets for family Christmas celebrations are full of gourmet crackers, aged cheeses, and exotic sweets. 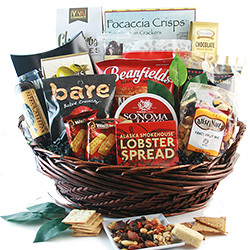 Each item has been carefully selected to complement the other products in the basket, so you’ll be sending your favorite foodies a well-curated collection of the finest flavors.